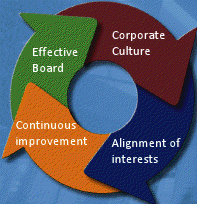 Having a strong corporate governance structure has become an important element of a company's success. At CREIT, we have developed a number of governance principles that provide the framework for our approach to corporate governance. Good corporate governance starts with Board composition. A Board should be both independent and well-qualified. A well-qualified Board is one whose members collectively bring the required skill set and experience to provide the appropriate oversight of CREIT's business. Governance is a function of corporate culture. Integrity has to be embedded in the culture. Contrary to popular belief, it is not regulatory compliance that will protect Unitholders, but rather the embedded integrity of the Board, Management and employees. The corporate culture must also embrace comprehensive disclosure practices. This means full, true and plain disclosure that is also timely. Alignment is achieved through the ownership of CREIT units. Each of our Board members is required to make a pre-defined investment in CREIT units while the President and Chief Executive Officer has a much larger ownership requirement. As well, it is significant that approximately 90% of CREIT employees are Unitholders. CREIT focuses on continuous improvement through training and education, process improvements and technology. We recognize that there are always things that we can do better and we make a concerted effort to continuously improve.